Enjoy a unique bed & breakfast experience where there is only one cabin and you are the only guests on the property. Privacy and serenity is what you will find under Sophie, a majestic 400 year old oak tree nestled behind the cabin. 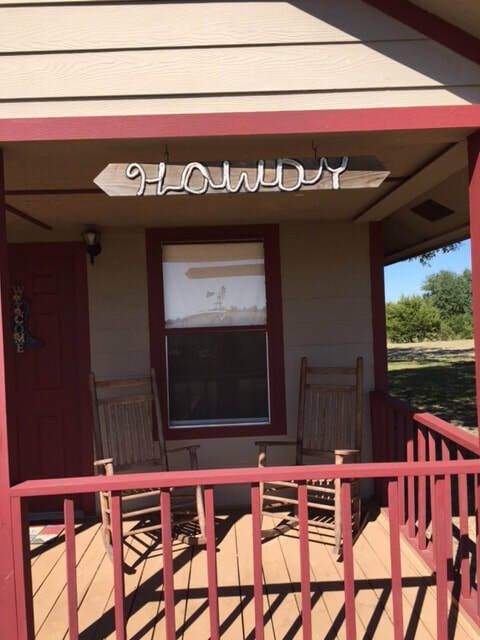 A beautiful, peaceful, ranch setting makes it easy to sit back, relax and take in Texas sunsets, enjoy the bluebonnets (in season) or do some fishing in the pond that's on the property. *We're far enough out that it's restful and quiet here at the ranch. But since we're in Washington County, there's always something to do within easy driving distance. *Still Waters Ranch makes a great base for shopping trips and exploring the many nearby attractions. 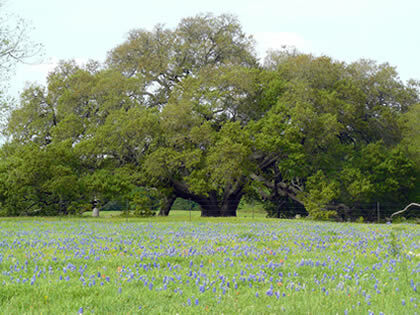 We're 12 miles from Round Top where nationally known antique shows are held in April and October. It's easy to avoid the traffic jams when you stay at Still Waters Ranch. Follow the country roads without traffic to Round Top or Warringnton. Antique Weekend​ - Now booking for the 2019 Fall Antique Show and 2020 Spring Show. The old oak tree, Sophie; the cabin to its right. Twelve miles in the other direction takes you to Brenham, home of Blue Bell Ice Cream, Blinn College and a charming and historic downtown. If you are interested in checking out the Wineries, there are some wonderful times awaiting you close by. Review: It couldn't have been more perfect for us. The cabin was very clean and we had everything we needed for the night. Sophie was beautiful and inspiring. We enjoyed feeding the fish, picnicking and watching a beautiful sunrise. We hope to return soon.